Today Microsoft released a preview of the Template Apps – A new experience that was designed for partners and ISVs to deliver streamlined analytics to their clients (If you still don’t see this new experience, don’t worry – I was told by Microsoft that it will take couple of days to be fully deployed on production). As a vendor of analytics solution, you can package Power BI reports and dashboards via the new Template Apps with new application life cycle user experiences and publish these templates on AppSource. As a consumer of the Template Apps you can install the Apps in your Power BI tenant from AppSource or by clicking on a specific URL that is provided by the Template App vendor. This technology will gradually replace Power BI content packs and solution templates and allow partners to provide agile analytic solutions that connect to predefined data sources like 3rd-party SaaS (e.g. Salesforce, Marketo, Facebook), Microsoft cloud solutions (e.g. D365) and anything on the evolving ecosystem of CDM (Common Data Models, here) including SAP and Adobe data sources which joined Microsoft in the Open Data Initiative (here). As a provider of Template Apps, you can follow these steps to create the Template App and distribute it. 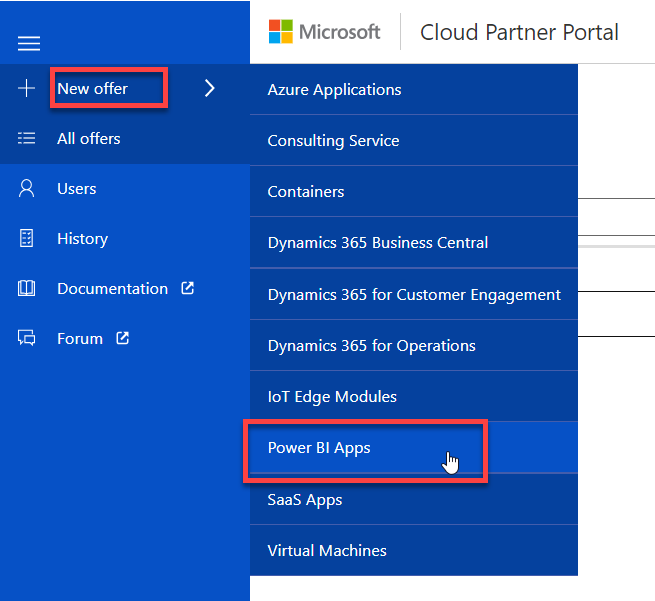 Make sure that you have a Power BI Pro license. Go to PowerBI.com and click the Settings icon, then select Settings. In the General tab, select Developer view and check the Enable template app development mode (preview) as shown below. By doing so, you will declare yourself as a developer of Template Apps and be able to start generating Template Apps. Note: Your Tenant Administrator can block this functionality under Admin Portal, Tenant Settings. You can see in the following screenshot that both creation (Template App provider’s side) and installation (the client side) of the template can be disabled. 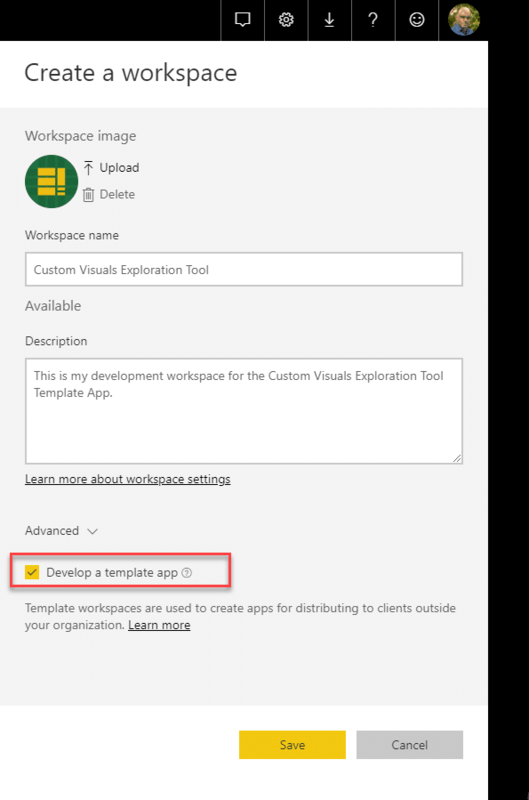 You can now turn an existing Workspace (which was not published as an App) and in its settings enable the “Develop a template App” checkbox to convert it into a development workspace of a Template App. 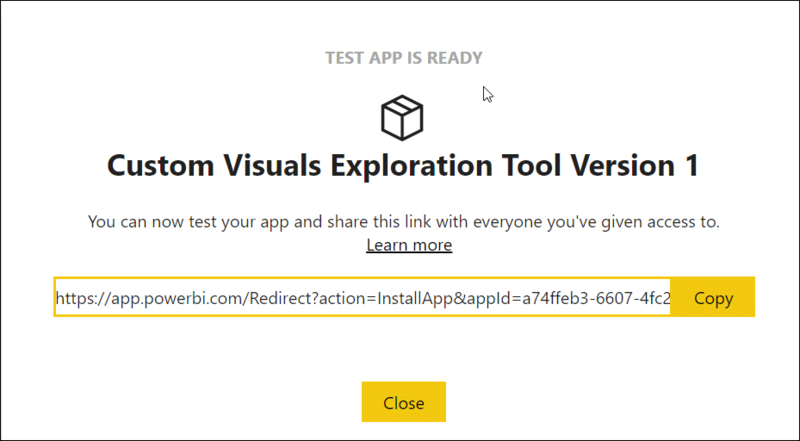 You can also create a new Workspace and turn it into a development workspace, but in that case, you will need to import the .pbix report via the Get Data in PowerBI.com. Let’s show you how to start from a blank workspace. 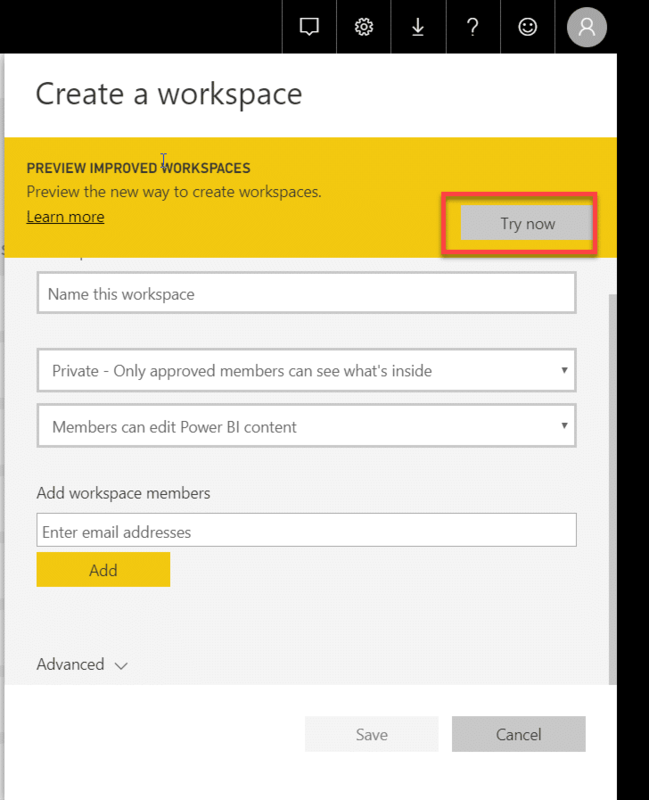 Create a new workspace and click the Try now in the Create a workspace pane. 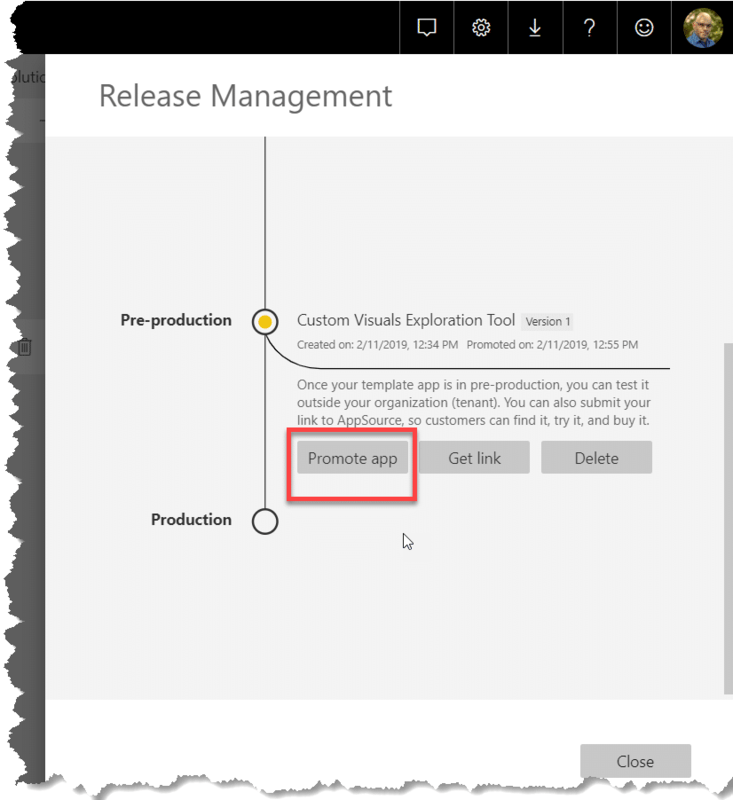 You will see under the Advanced section a new checkbox: Develop a template app. Enable it and provide the Workspace image, name and description. When you are ready, click Save. You now have your development workspace ready. It’s time to upload your Power BI Report to this workspace. In the Files section of Create new content, select Get. Select the Power BI report you wish to distribute in the Template App (Keeping reading below to learn about some of the limitations on the type of supported datasets you can use in such reports). 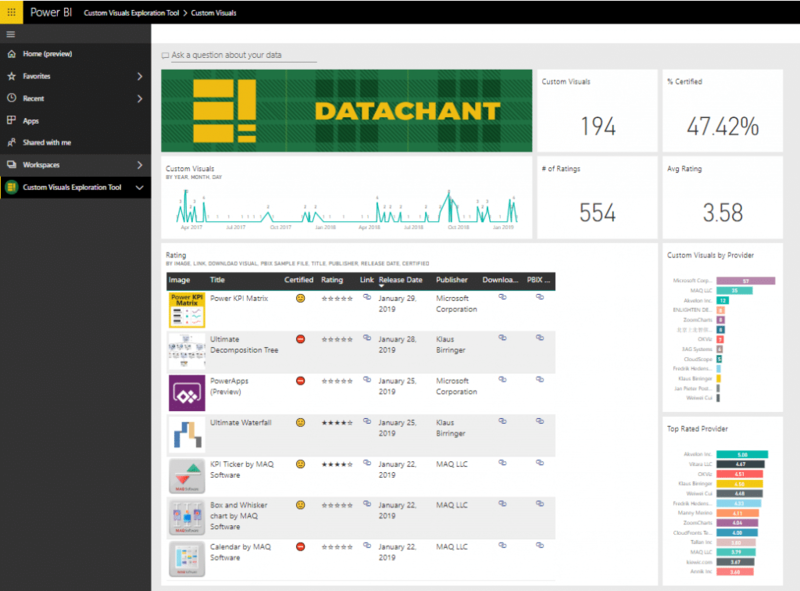 In the Power BI service, you can now create a Dashboard. Here is the dashboard that I have created. Make sure that the dashboard is set to Included in App. When you select the Reports section of your workspace, you can also make sure that your report is set to Included in App. You can now click Create App. But before you do, check out the new link: Release Management. Wow! 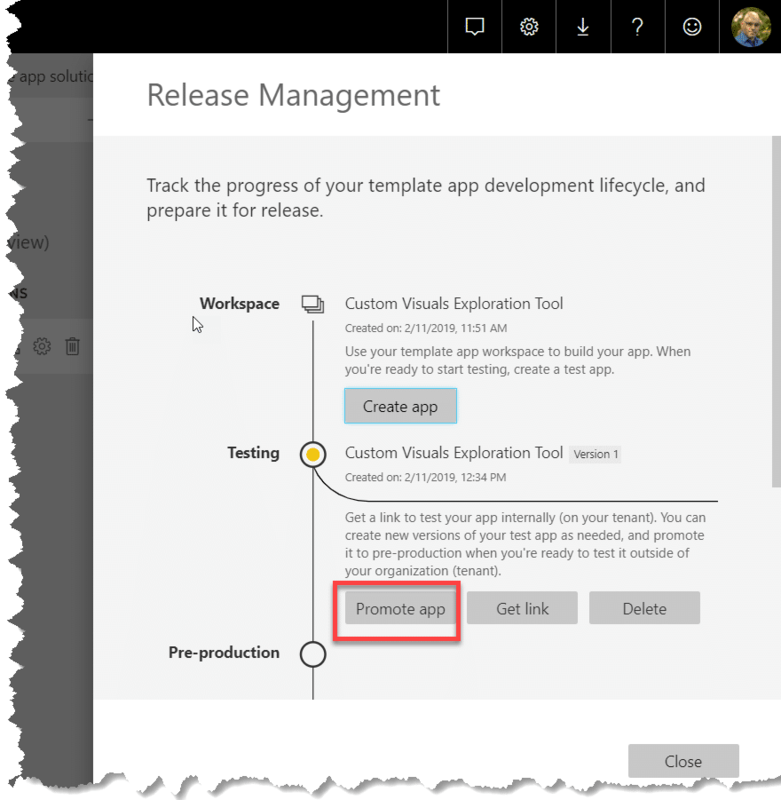 The Release Management is one of the new cool experiences that allows you to manage your Template App lifecycle. Here is a screenshot of your Release Management view before you click Create App. Once created, you can now start defining the Template App settings. You will find it very similar to the current App experience when you publish a regular workspace as an organizational App. In the Content tab, you can select the dashboard as the App landing page. This is recommended for a better first-time user experience by your template installers. 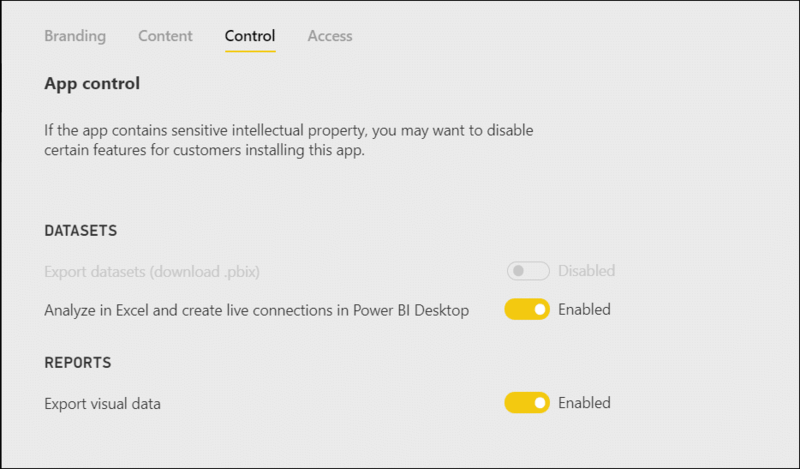 In the Control tab, you can enable or disable the ability by your clients to download the pbix file (You cannot enable the download pbix in the preview), apply the Analyze in Excel, create live connections to the dataset on PowerBI.com or export data. In the Access tab, you can set permissions to your testers to access the template (Testers should be on your own tenant). When you are done, click Create App. You will now receive the message below and can share the Template App with your testers. Just copy the URL in the main text box and share with them. The testers of the Template App will be able to install the template and test it. The tester who installs the app, will see a new workplace (ending with the suffix ” 1″). Like normal Workplace developers, they can now connect data to this workspace, set the schedule refresh, and test it. You will receive the following notification. You can only keep one version of your template in a pre-production. If you already have reached the pre-production phase, the old link will no longer work. Click the Promote button to enter pre-production. Copy the link and share it with your selected clients as a preview of your template. You can consider this version as your preview. Your external users will be able to test the template on their own tenant. Note: Any user with Power BI pro license will be able to install this template. While this is not a recommended approach to share content between two tenants (More details in the Q&A section), Microsoft will not prevent users from other tenants to use this link. Are you ready for production? Click the Promote app. You can only keep one version of your template in production. If you already have reached the production phase, the old link will no longer work. Click the Promote button to enter production phase. Here is where you can get your production link. You can always get the links in Release Management. Copy the production link in the Technical Info section. From here, you can proceed through the settings to publish the Template App. 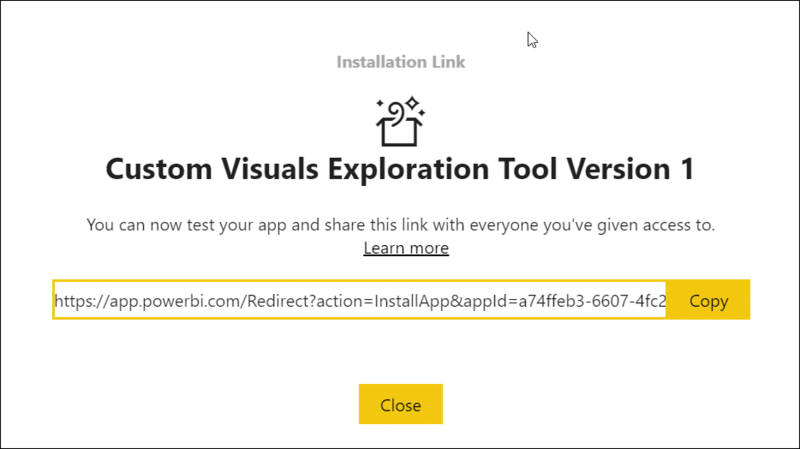 They will receive this message, and from here they explore the demo data of the App which includes the data of the last refresh which was done in Power BI Desktop before you imported the report to the workspace. 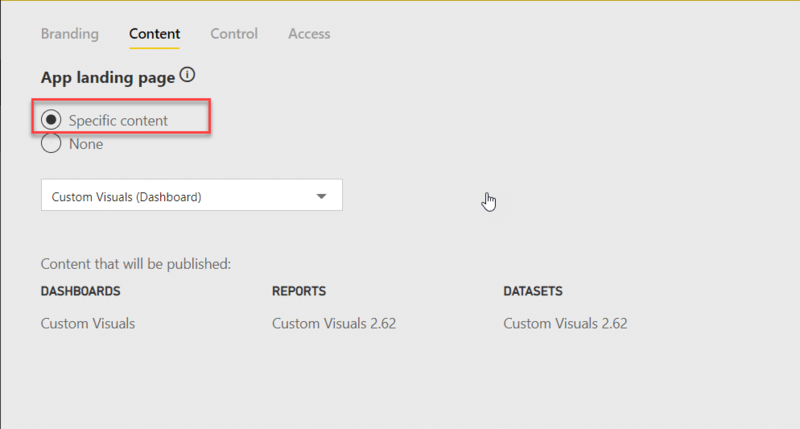 Your users can also modify the report (currently from PowerBI.com) and connect to the data by setting the dataset. What do I like about the Template Apps? The Power BI Template Apps enable a new breed of Analytic capabilities and consulting services. Microsoft partners can create innovative and reusable solutions that skip the arduous development cycles of data preparations and modeling and engage their clients with immediate insights. The potential here is limitless. As a provider of demos and Power BI templates (Check out my new shop), I can now publish some of my paid reports as Template Apps, and allow my readers to easily consume them and share in their organization. And I don’t need to share the Power BI report files when I share Template Apps. This special capability enables me to treat my source code (e.g. M queries, and advanced DAX in the .pbix files) as an intellectual property and keep it intact. What is currently not supported? As a publisher of a Template App, you can currently only package one dataset, one report and one dashboard within the same template. You cannot include dataflows in the template, but this capability will be released in the future. You cannot include paginated reports or Excel workbooks in the template. What are the licensing requirements for Template Apps? 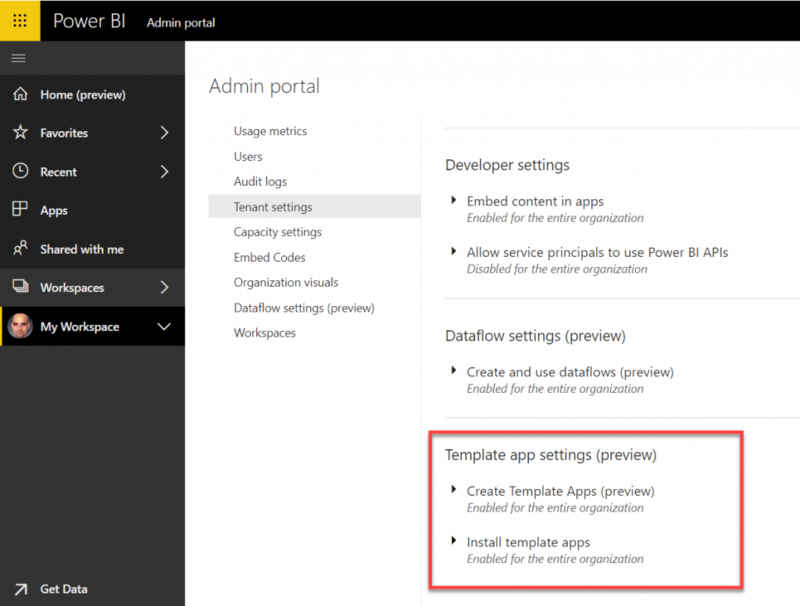 A Power BI Pro License is required by both the Template App provider and the installer of the app. Once installed, the regular Power BI licensing rules are applied for the consumers of the app. I am using a content pack. Will it keep working? Old content packs will be deprecated after 3 months since the GA of Template Apps, so you better start migrating the content packs to Template Apps. Can businesses build Template Apps and share it with their clients? While anyone can build a Template App and share its link by email with his clients, only registered partners can publish the Template App to AppSource. Microsoft recommends that customers will keep using the old B2B scenario (which was published here) to share reports across different tenants, and only partners and ISVs will go through the new Template Apps path. What is the difference between a Power BI App and the Template App? The Power BI Apps are not new. You can read about them here. Apps were designed as the main organizational consumption experience. They are published by Power BI developers in your organization from their Power BI workspaces. The Template Apps are developed by partners (outside of your organization) and can be installed in your tenant and be customized. When a template App is installed, is the installation done on my computer or on the cloud? 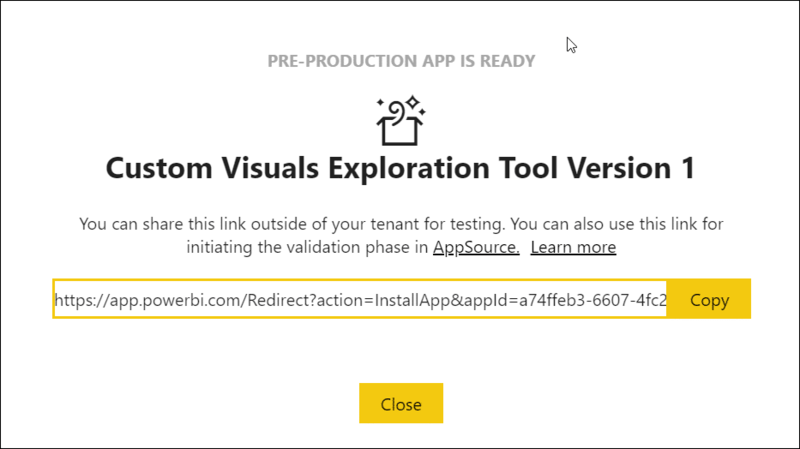 As the installer of the Template App, once you install the template, it will reside on your tenant’s Power BI cloud environment, and not on your computer. 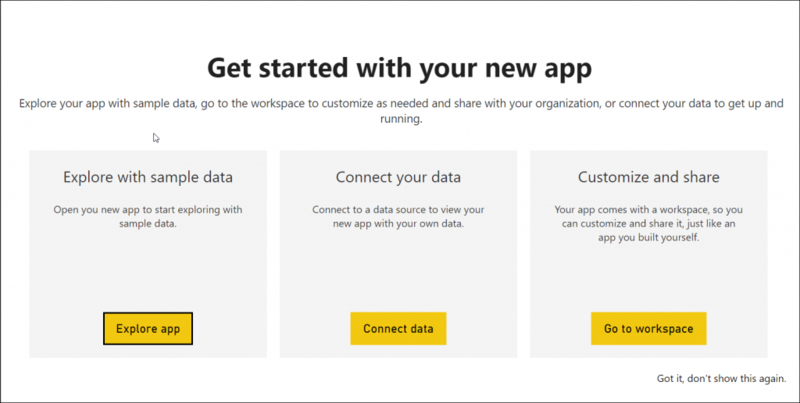 After the installation process is complete, you will get a new Workplace with all the Power BI artifacts in the template, and a new App that can be shared in your organization. The new workspace and app function like any other normal workspaces and apps. As a developer of reports, you can add new artifacts to your workspace. This is your development environment. You can make updates to the published app, so consumers in your organizations can consume the app. Can I download the Power BI reports (.pbix files) that were installed as part of the Template App? It depends. Partners can distribute templates which will allow you to download the actual pbix files from the service (Here is how) But they can also disable the ability to download the pbix files. Those pbix files can be treated as their source code, and they can now protect their intellectual property, and prevent clients from gaining access to the pbix files. Are the Template Apps offered by partners for free? For now, the answer is yes. In the future Microsoft will enable partners to offer paid Template Apps. How will the Template App connect to my data source? Does it come with demo data if I don’t want to connect it? After you install the Template App, you will see that the reports and dashboards contain the demo data. To connect them to your data source, you will need to set the schedule refresh on the datasets in the workspace that is generated after the installation. In the next blog post I will update you about my published Template App in AppSource. Stay tuned. Gil, Looks promising. Assuming that the constraints “one report, one dashboard, one data set” and “free” will go away once preview is complete.